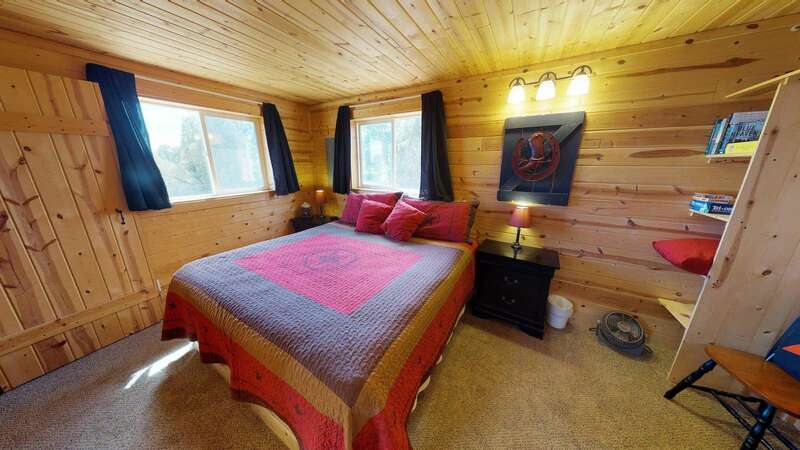 Cozy Secluded Cabin in the Pines, King Bedroom and Queen Bed in the Loft. 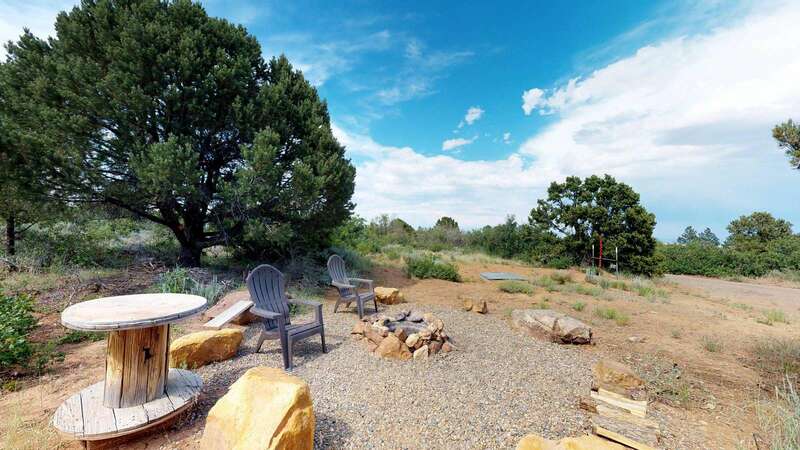 This Mountain Cabin is located among 12 National and State Parks in the heart of Canyonlands. 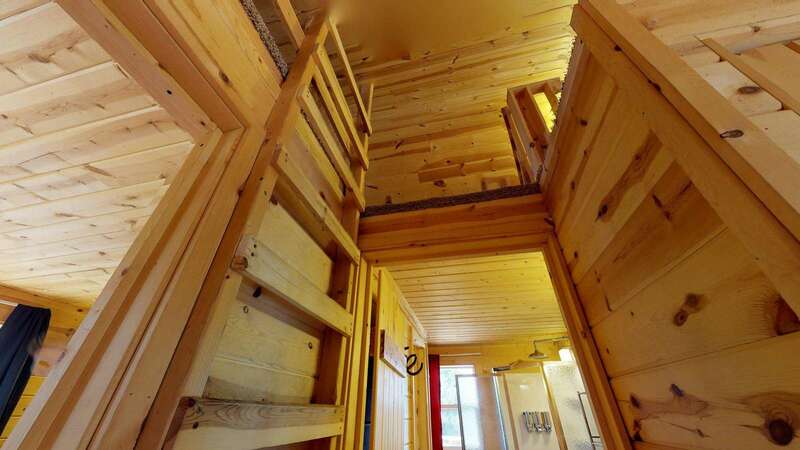 The White Pine Cabin by Canyonlandslodging is perfect for couples and small groups. Sleeps up to 6 people max. including the Queen Futon. 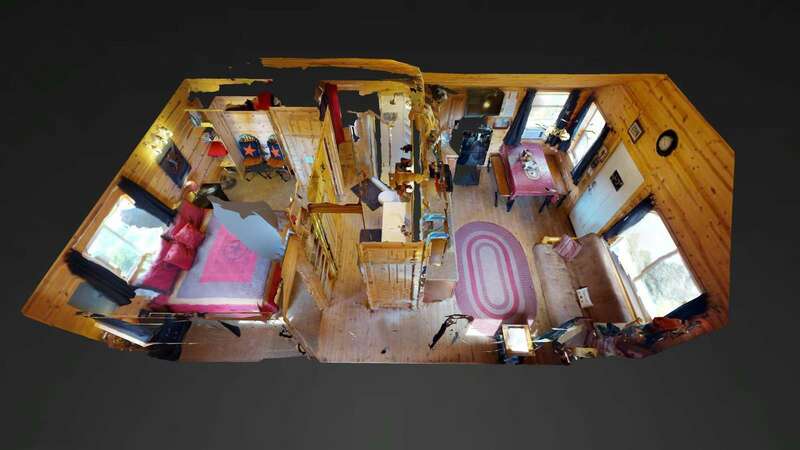 Featuring beautiful wood flooring, carpeted bedroom, and loft. 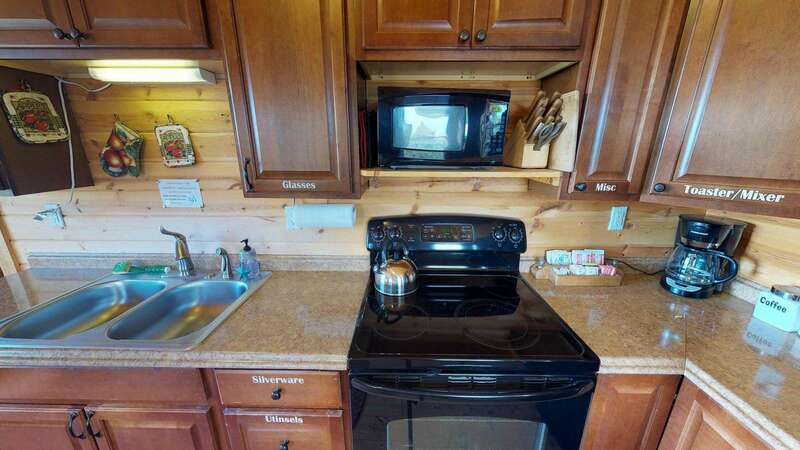 The fully equipped kitchen makes any stay at the White Pine Cabin a unique western treat. 6-place dining table, full bathroom with glass shower enclosure, 2 flat-screen TVs, Wi-Fi, BBQ grill, picnic table and more! The cabin features a king bed in the master bedroom and a queen bed in the loft, and is ready to welcome you with a Homemade treat and a Sarsparilla Drink. All the linens, blankets, and pillows are included. The loft has a queen mattress bed and is carpeted for extra comfort and fun with extra blankets, pillows, and pads as well as a tv and DVD player - a great place for kids to hang out or for extra sleeping space if there are more than 2 guests! The futon also serves as a two-person bed. Outside you will find beautiful surroundings, trees, and nature, as well as an amazing view of the Abajo Mountain. There is a campfire area for enjoying the evenings outdoors. And the best part of all - it's just a short distance to 14 national and state parks and monuments! There is parking for all your vehicles, trailers and toys! Come enjoy the great outdoors and relax at Canyonlands' White Pine Cabin! (Pets approved upon request. 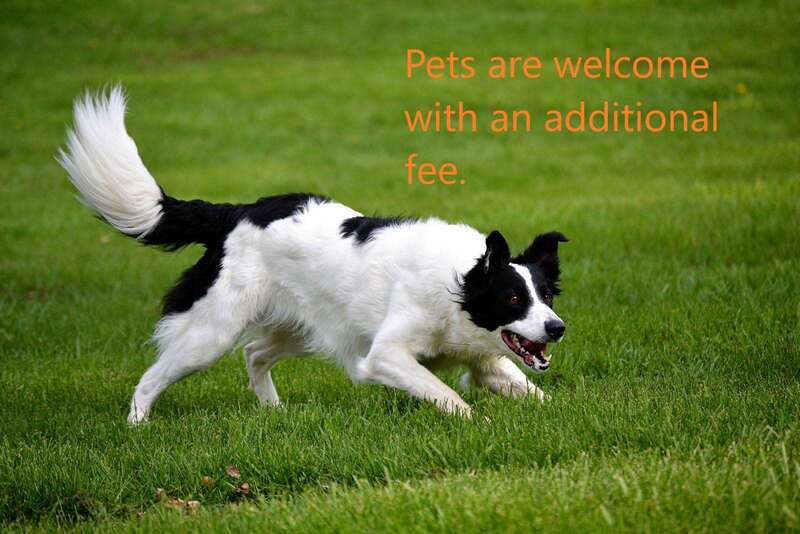 $30 fee applies, per pet). I had a great couple of days, despite a snowstorm foiling some of my plans. I was nice and cozy in the cabin and Jerry helped to plow and shovel my car out once it cleared up. Would definitely recommend and I hope I can make it back during better weather to explore the area some more soon! We absolutely loved how cozy and warm this cabin was, we also had a great time cross country skiing on the hosts recommendation! This place was excellent! Would definitely recommend or stay again. 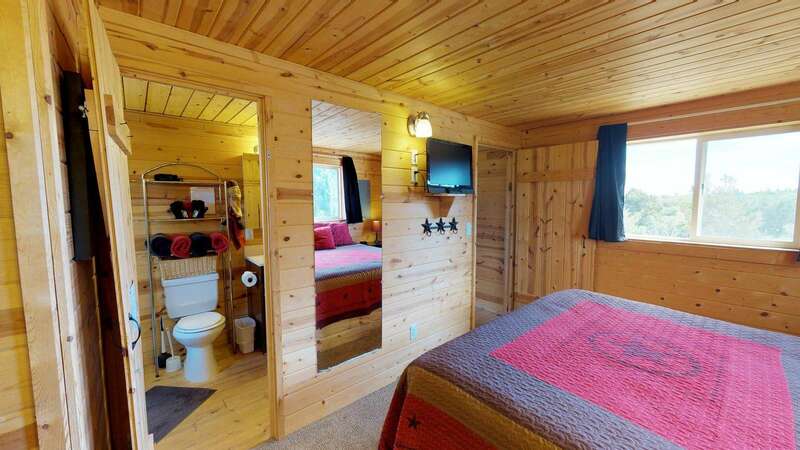 White Pine is a great little cabin, with all of the comforts of home. The location was perfect for me. Very clean and quiet cabin. Very private with great views. And they go out of there way to add a bunch of nice small details to make the stay nicer. 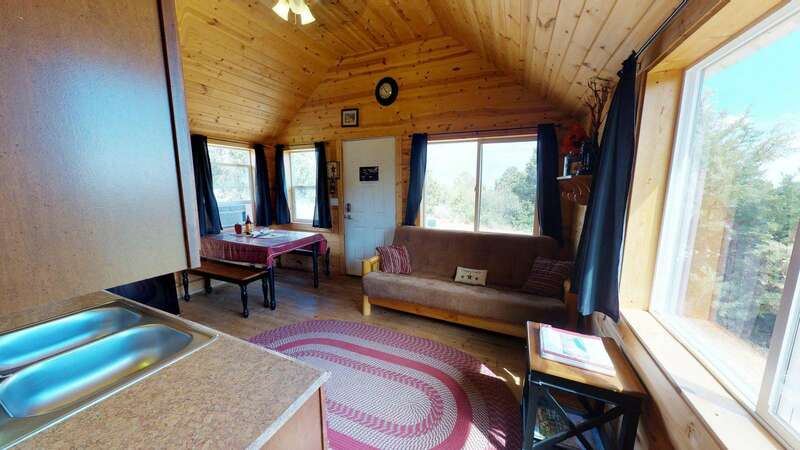 This little cabin is a gem on a beautiful piece of property. It looks like a great place for group events and fun times in the summer! The snow capped mountains were lovely over Christmas. I would stay there again. Thanks for everything! Thank you so much for providing a better then expected experience in Canyonlands! The place was cozy and just far enough away from the towns. Everything from the quick responses, to the decor to the all the little things provided (the dog treat and cookies were so welcoming!) make this a 5 star place will defiantly stay here again!! What a great little hideaway! I was looking for a place where I could "get away from it all" and the White Pine Cabin fit the bill. 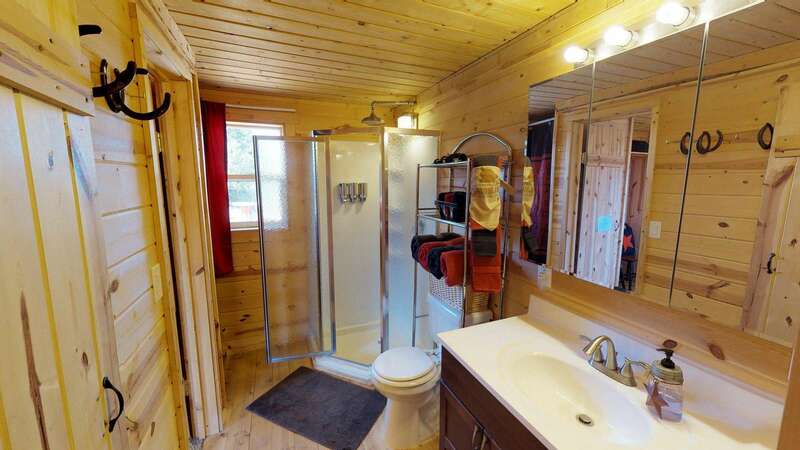 The cabin is nestled in the trees so you have total privacy. 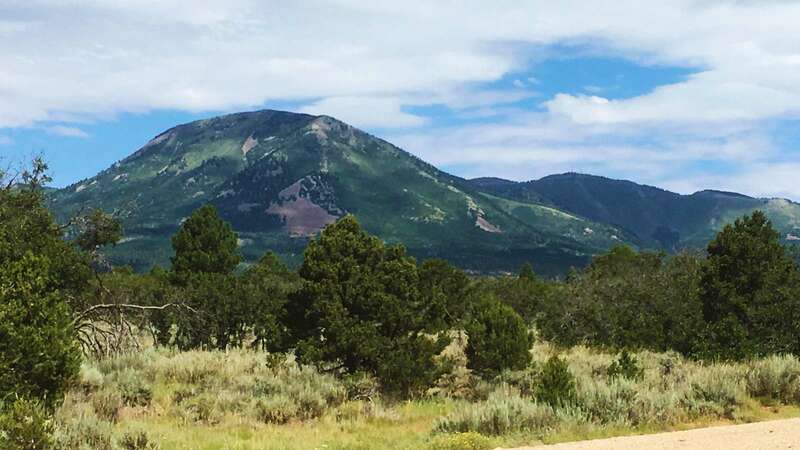 The setting on the side of the mountain is beautiful and the many windows offer nice views of the mountain behind the cabin and from the front step you can see to Colorado! I felt as if I had the mountain to myself and no one could ever find me there. 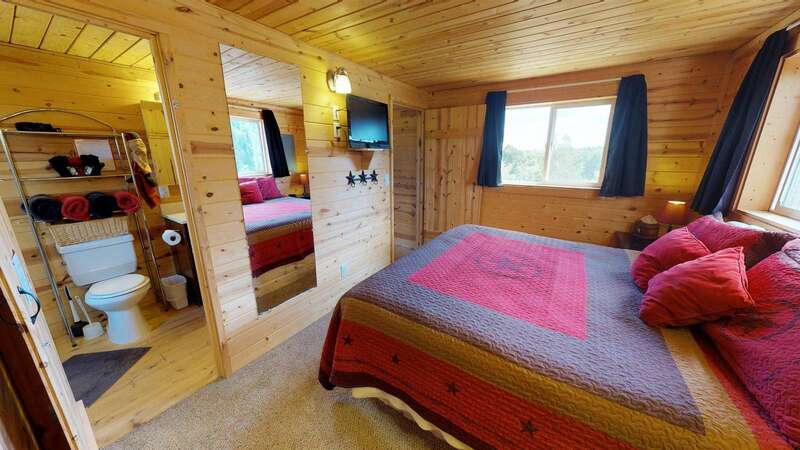 The cabin has a cozy western feel, I liked the cowboy details. Bedding and linens were quality, all the amenities were there. I was there in December so there was always a blanket of sparkling snow on the ground and surrounding trees. The light glistening off the snow and viewed out the aforementioned windows was mesmerizing, I found myself hurrying back to the cabin so I could watch the winter twilight. White Pine Cabin exceeded my expectations. If you're looking for a secluded private hideout this is it. The White Pine Cabin was great! Perfect as a little southern Utah get-away for a weekend alone with my girlfriend. The Cabin had everything we needed and more to make for a relaxing weekend away from the city. Highly recommend! We loved the cabin! 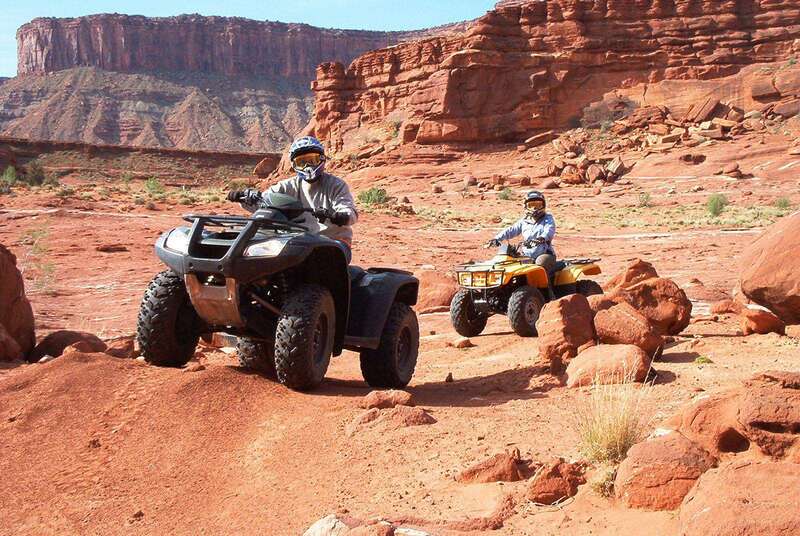 It’s in a great location not to far from the Canyonlands and Arches National Park. Everything was super clean and they had some thoughtful personal touches. We’d recommend this place to anyone and everyone! WOW...what a breath-taking cabin! Don't think about it- just book it! 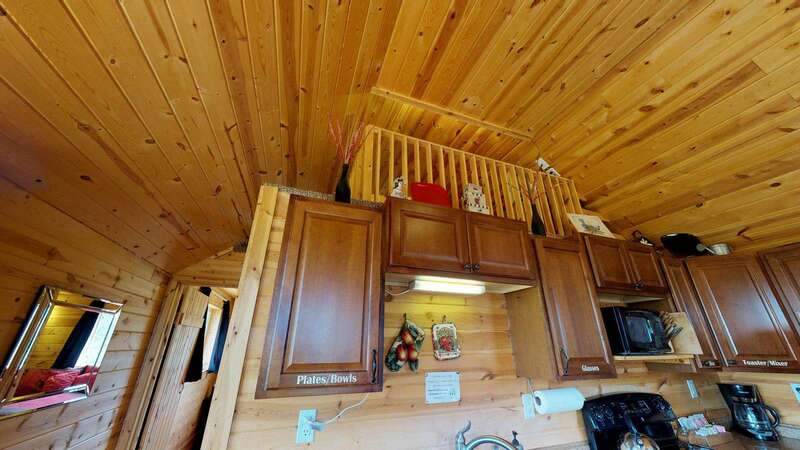 Gorgeous spotless cabin with ALL of the amenities of home, and then some! Not to mention the incredible surroundings, magical mountains and TONS of deer to admire. Wish we could have stayed longer than one night...we will definitely be back in the future. Great hosts, too! The cabin was a treat. It is cozy but it works. 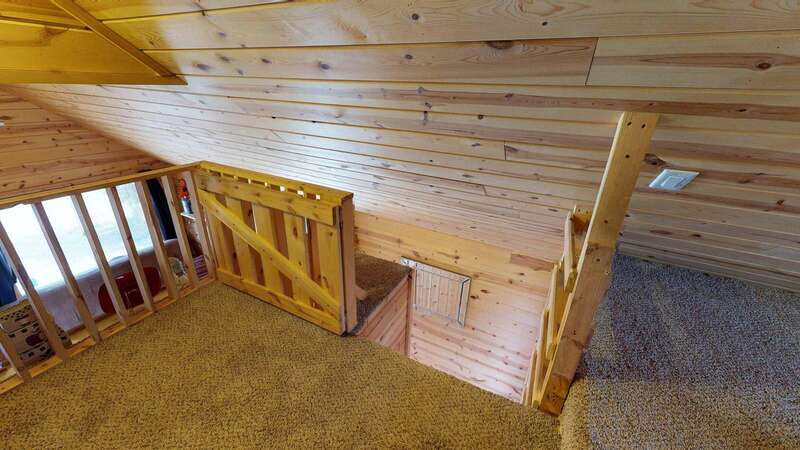 The master bedroom is spacious and the upstair loft has nice space but requires an eight foot latter to get there. The cabin is in wonderful scrub oak, juniper and pinion pines. Lots of birds and deer wander by. Very quiet with spectacular dark skies at night. We hope to stay there again. Another great stay in Monticello! The place was great and the hosts were very responsive and easy to get a hold of. Would stay again. The White Pine cabin was a very nice quiet clean place to stay. The neighbors were not close. The kitchen was well equipped. We did not get to meet Jerry and Tina as we came in late and left early. We did not give it a 5 star because I wanted a cabin in nature. But we got in and smelled perfumed dryer sheets or fabric softener particularly in the bedroom and bathroom. And opening windows did not help much. We guess they are being used for the low humidity and static. But I would recommend that if they must be used at all, that it is unscented. 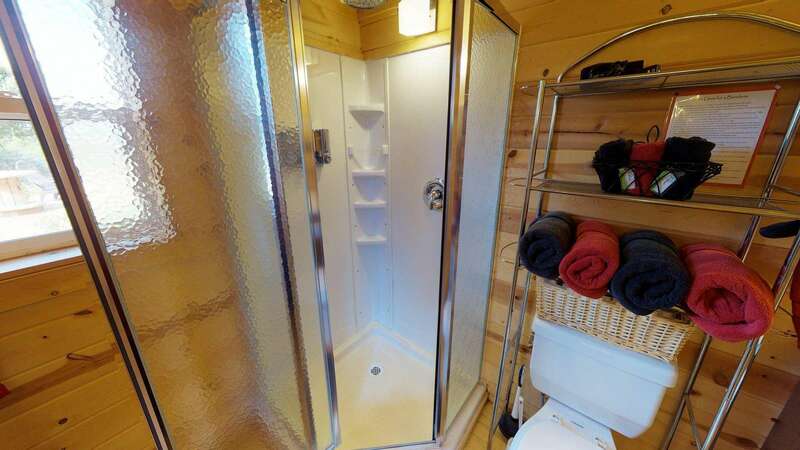 The White Pine Cabin is immaculate, private and well stocked. We found it roomier than we expected. Only wish we had more time to explore the area. We were able to easily locate this cabin even upon arriving in the dark. It was super quiet. The cabin with very cute and well supplied with all we needed for linens and Kitchen equipment. We enjoyed being away from town in a bit more of a recreational type environments. Our booking was smooth and they were always available to answer our questions. This Condo was comfortable for our needs. The bed was comfy and the kitchen had the supplies we needed. We enjoyed the location and it was a very quiet stay. Amazing space, view and amenities. Great communication from hosts. What a quaint cabin! It was close to southern points such as Monument Valley, but also close enough to get to Moab and Arches. Blanding and Monticello, towns nearby, have grocery stores. This cabin had a full kitchen and that made it easy to eat! This place is cozy and quiet, and offers everything you would wish during a stay in a cottage. We liked especially the binder with lots of great information about the area. We met Tina and Jerry, who were very kind and helpful suggesting activities in the surroundings. Great place! So cute and great for families. Loved that there was a playground for the kiddos after driving all day. Everything you need is in the cabin! A beautiful cabin under the stars. A zillion times better than the roadside hotels in the area. Nice secluded/private place to stay. If you want privacy, the host will leave you be. White Pine Cabin was very clean. Comfortable bed, bedside fan, and window a/c in the kitchen/dining area were nice things to have. Plenty of bathroom space. 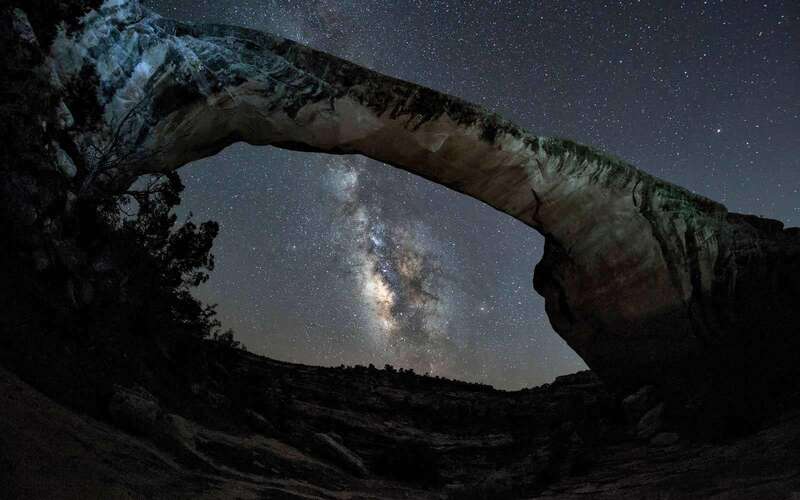 The venue is a 1 hour drive to and from Moab/Arches National Park. We enjoyed our short 2-day stay. This cabin was definitely off the beaten path but was well worth staying there. It’s was beautiful. Had great finishes and amenities. I would recommend anyone who needed to stay in or around Monticello to stay there. 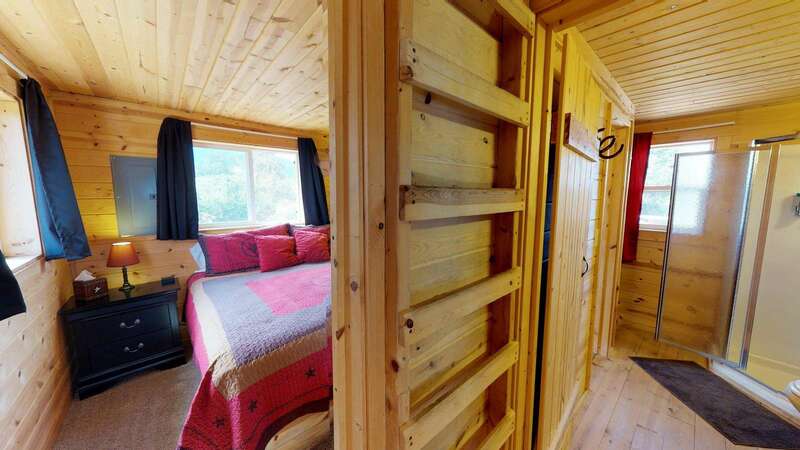 Great cozy cabin, with cheerful greetings and wonderful suggestions for hikes and sights in the area! I was only able to stay two nights but so appreciated the handy notebook provided with pictures, maps and suggested places to go. I would definitely recommend staying here again! 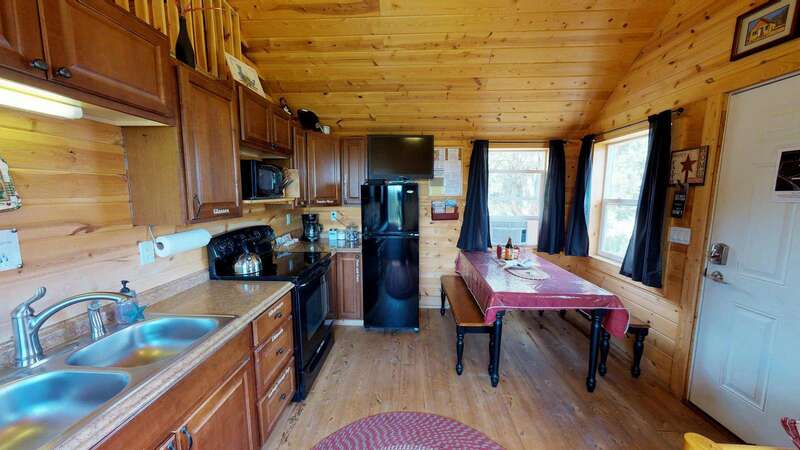 Excellent location, beautiful spotlessly clean cabin with great amenities. Wonderful little cottage house with ample space and doesn't feel small, in fact, it feels quite homey. The place was very clean. Wish we could have stayed longer. Lots of land to explore and wish we had the time to. Hosts were very informative and helpful with any questions we had. The White Pine cabin is just wonderful. 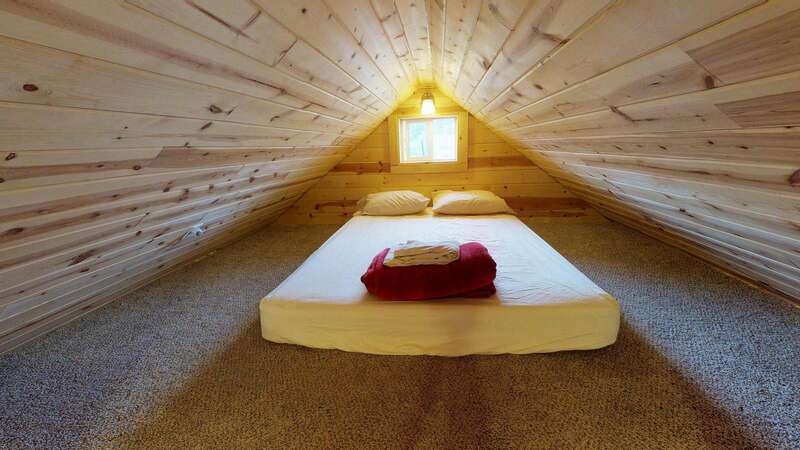 So cozy and charming, toasty warm, comfortable bed, stocked with everything you might need. Not only were there muffins and sarsaparilla soda waiting when I arrived, but the hosts provided fresh eggs from the ranch! Jerry and Tina have thought of everything. The perfect cabin getaway. This was a wonderful place that we booked last minute and Jerry was very responsive and attentive to our needs. It was great for a quick getaway and well worth the value. They even provided farm fresh chicken eggs and homemade brownies! This place exceeded our expectations, felt very cozy and we will definitely look to return again on our next trip to hike in the Cedar Mesa area! We never got to meet the owners but were treated to some fresh brownies waiting for us on the table. The cabin was very clean and quiet which was just what we were looking for. 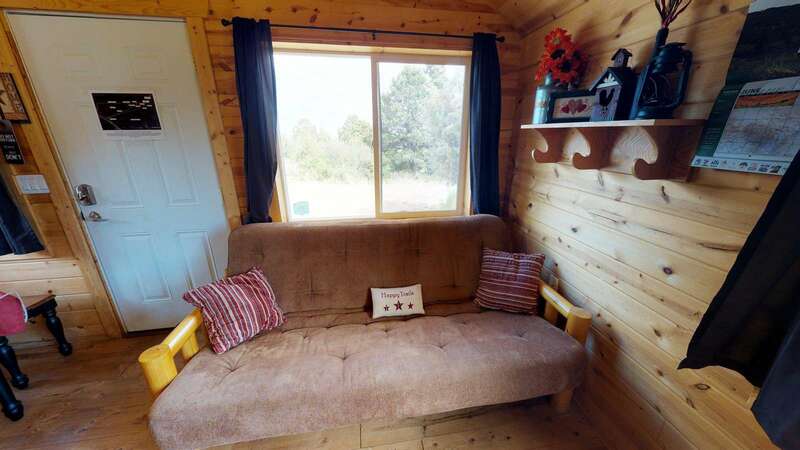 This lovely cabin is spacious yet cozy and a real treat to be present in when one is in beautiful southeast Utah. The White Pine Cabin was a perfect respite for us after completing the White Rim Trail in Canyonlands NP. The cabin was perfect for the four of us. We’d return if we’re ever back in the area. My GF and I wanted an isolated place to stay, surrounded by nature but we didn't want to go full-on into camping/tent life. The whitepine cabin was perfect. We had wi-fi, heat, hot water, televisions, a primo kitchen set-up...but there was literally nothing around us. We could just walk outside and lose ourselves in the surrounding area if we wanted. At night, the sky was completely open and it was perfect for star gazing. This was our last stop on a cross-country road trip and the silence and tranquility offered by the cabin were exactly what we wanted. Beautiful location with a stunning sunrise. The white pines cabin was clean and the hosts were very hospitable. It was well worth it to stay there. Loved staying here! We stopped by on our way across the country, only stayed one night but will definitely be coming back to stay longer. White pine cabin was clean and spacious. Had WiFi, cable, dvd selection, multiple TVs. However there was no need for cable with the clear view of the stars at night. 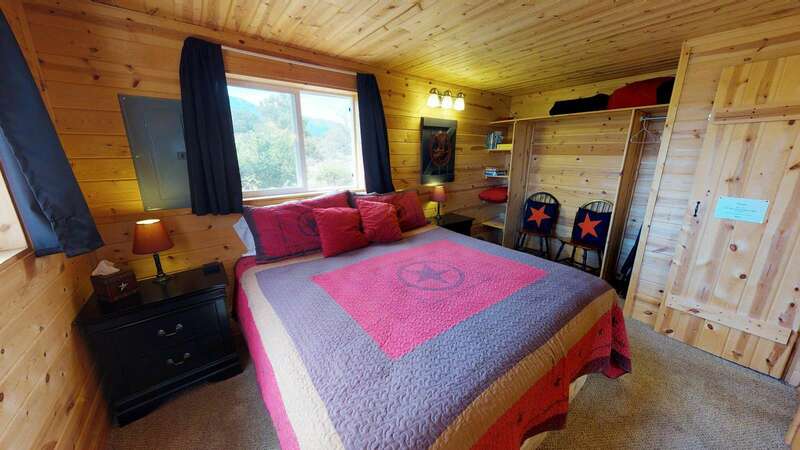 Cabin has everything you may need for a nights stay or longer! Little bit of a drive from Moab but worth the drive to get away from anything too commercial. loved the cozy whitepine cabin for our 5 day stay. everything we needed was there and laid out in a user friendly way. would stay again. excellent. We found this place at the last minute while grabbing groceries in Blanding. We just needed a place to stay before heading into Canyonlands for a couple days. If I had known about it sooner I would have absolutely have stayed at least another night. We were in the White Pine cabin. It was a nice clean little cabin. The bed was comfy, the kids loved the loft, and the kitchen table was perfect for playing games with the family. We’ll be coming back to this incredible State in the next year, and will be sure to include it on the schedule. The White Pine cabin was a terrific end to our family’s week long trek to Utah’s five national parks. Jerry’s directions were spot-on, so we were to find our way to the cabin on the first try, in spite of full dark. The cabin was very cozy, and we loved the little touches like the root beer and the bandanas. For anyone with kids, the guest ranch also has a fun playground right down the path. We never had anything to worry about, and thoroughly enjoyed our two short nights. 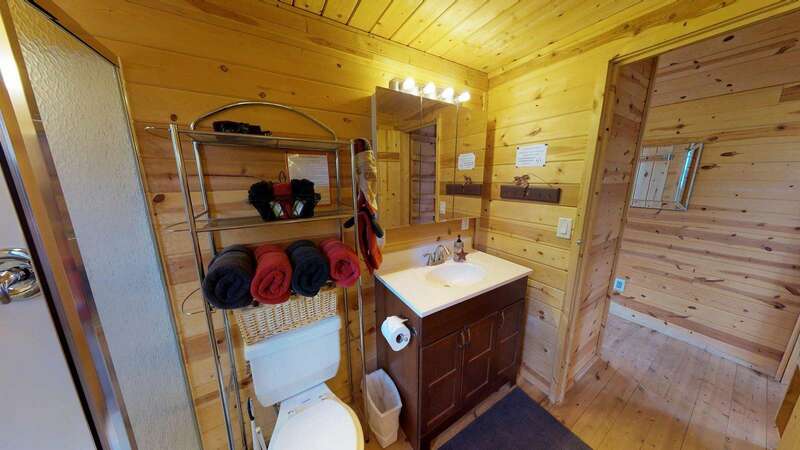 What a fantastic white pines cabin has everything you need. We Loved staying there. Would highly recommend it highly. We loved Jerry’s white pine cabin, in a beautiful rural area well away from traffic and noise. It’s clean and nicely decorated, and had everything we needed to enjoy a few day’s visit to the Needles district of Canyonlands NP. 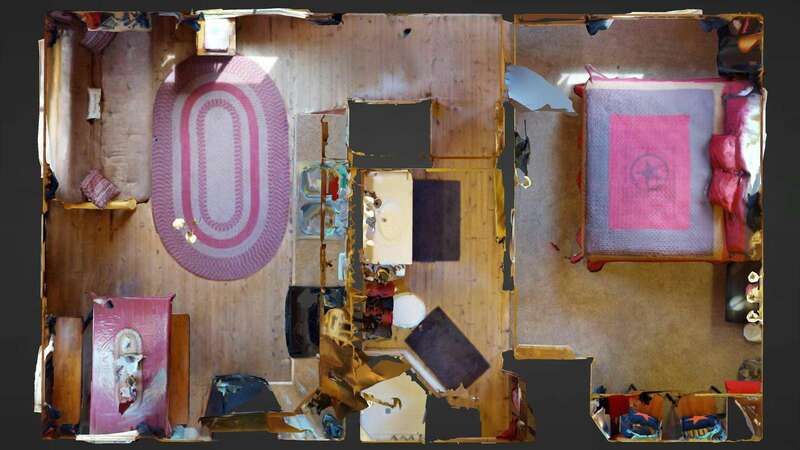 It was great to have a big comfortable bed in a bedroom separate from the living room – so nice to have more space than studios or hotel rooms! The bathroom had plenty of big fluffy towels for the much-needed hot showers after our days of hiking. We appreciated that Jerry provided muffins and soda, along with coffee and tea for the morning. The kitchen was well supplied with dishes, pots & pans, and appliances. The backyard chairs, barbeque grill, and firepit made a perfect spot to enjoy the beautiful views at sunset and a glass of wine! The TV and WiFi connections were good. Jerry answered all our questions ahead of time, and gave us some good suggestions for places to visit while in the area. We only wish that we had allowed more time for our visit to Utah, and would certainly stay in this cabin again. Thank you, Jerry. We very much enjoyed this rustic white pine cabin with our dogs. It had everything we needed! Beautiful spot to walk around with our beloved Bernese Mountain Dogs.The sarsaparilla drink and Muffins were delicious! Thank you! Response: We're glad you enjoyed your stay! Future guests, please note that pets are ONLY allowed on a case-by-case basis. Please inquire for details on bringing pets. This whitepine cabin is absolutely perfect! It is so secluded you just feel like you are in the middle of nowhere! We had the pleasure of seeing a family of deer around the cabin as the sun went down! One night certainly wasn't enough but we thoroughly enjoyed our stay and would recommend it to anyone! We Loved the White Pine Cabin! Cozy, nicely decorated, and everything that we needed for a great stay. We loved the quiet, space, amazing stars at night, and beautiful sunrise too. We stayed one night, and enjoyed lingering there in the morning, saying how nice it would be to stay longer. I also appreciate the clear directions to the cabin and lock code to get in. It was nice to arrive with a few lights on inside, a note from the managers, and a couple of muffins! Many nice touches helped make this a really enjoyable visit. Thank you! 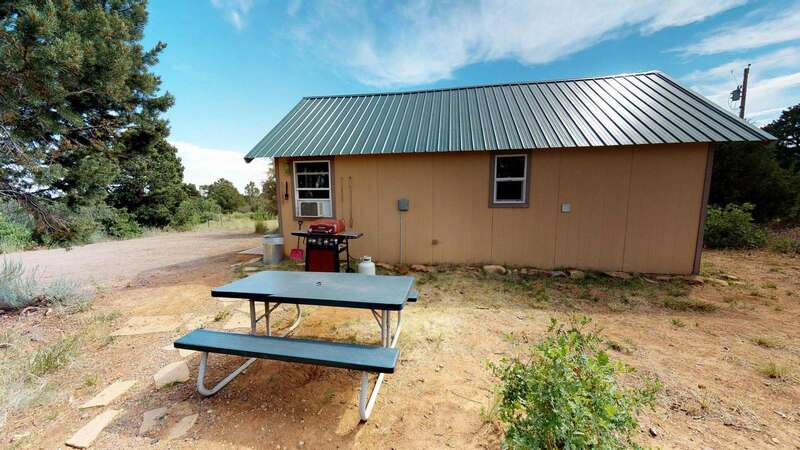 The setting is wonderful and very private, not like the other properties with rows of cabins that you'll drive by on Hwy 191. There is a great short hike through the canyon right next to the property that we took after arriving mid-afternoon. The property is big enough to walk around and explore. We saw lots of critters running around, from mini chipmunks to deer. The sunsets were amazing from the cabin. We had everything we needed for our visit to Canyonlands. Monticello is a really small town with really nice people. Jerry stopped by just to say hello and make sure we had everything we needed, but otherwise left us alone. Hopefully one day we'll be back. You can feel the wildness of the nature here under sky full of stars... will be visiting soon.. Awesome place.. keep up guys!! The White Pine Cabin was perfect for our family of 4. We enjoyed being able to cook, relax, and have access to several National Parks. It was fun to meet your beautiful dog. The place was very comfortable and welcoming with all the touches of home. Outstanding, my only regret is that I did not stay longer and was only passing thru the area. Clean, comfortable and convenient. I would highly recommend the white pine cabin to anyone traveling in the area, single, couple or families. Big regret was we only managed to stay for one night. 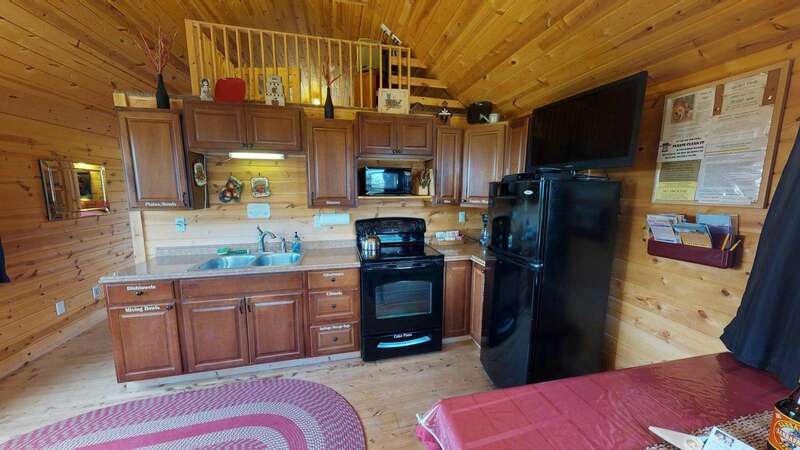 Cabin is beautiful with big kitchen and bedroom. Setting is great,out of the way and peaceful. Outside seating barbecue and fire pit are all at hand. Would definitely stay again. My son and I stayed in the White Pine Cabin. It was a perfect base camp for us in our travels around the area. Clean and comfortable. Will definitely stay with Canyonlands Lodging when back in the area! Thank you!! Close to south entrance of Canyonlands. Cute cabin, great for families. Beautiful views. Peaceful and private to say the least. The amenities were tremendous. We highly recommend this cabin to anyone and everyone! We will be back again. The place was beautiful, clean and well kept. Communication was great, especially since we booked last minute with a dog. Would stay again. This is an out of the way place with no nearby cell service or wifi until you check in. The hosts sent numerous emails with maps included to help us find our way. You need those, but in the end it was very simple even in the dark. Cookies and hot cocoa were waiting for us along with a welcome christmas tree making it festive and a bit like home. The space heater kept us warm along with the extra provided blankets. The kitchen was well stocked with everything you might need to make meals. Just remember to bring your food with you since you'll be 10 miles away from ANY place to eat. This is a clean and comfy getaway that we loved. Wifi and phone service were good as was the TV reception. It is close to the main road, but a million miles away from the rat race. It was a good place for us to stay while exploring the surrounding great parks and backcountry. There is a nice binder of information and we did take one of the suggested hikes in the morning and were so glad to be able for discover something new that we wouldn't have known about otherwise. We will definitely keep the White Pine cabin in mind for future trips to the area. Joshua’s review is now posted on your listing page. We loved, loved, loved everything we did and saw while staying in your home. We have several copies of the Book of Mormon and read them every night. Thank you for your visit to the lands of Southeastern Utah and Ancient America. In this 100 mile circle, it is estimated that at some point there were between 1 to 2 million people that lived here. As you traveled through the area you would have seen some or many of the signs leading to the ancient ruin sites and petroglyph sites, there are over 500 recorded sites here. The ancient history of the Americas is almost unrecorded except for the writings of the prophets and kings that lived here. Around 600 years BC, two groups of people left Jerusalem and sailed across the seas and arrived at what is now known as the Americas. They left a record of the teachings of the gospel of Jesus Christ, their wars and migrations which were written by the kings and prophets. This record was translated in the early 1800's and is now known as the Book of Mormon, named after the ancient war captain and prophet Mormon that compiled their records. As a gift to you for your visit and a thank you we would like to have a Book of Mormon delivered to you for free, for you to be able to read the ancient writings and prophecies of the Americas. You will find it fascinating! Please reply to this email to receive this free gift, and let us know in which language you would like it written in. Thank you so much for your visit, and enjoy the gift. My husband and I enjoyed 12 days at The White Pine Cabin. Anything we possibly needed was there! We also appreciated the extra touches, cookies, soaps, shower gels etc. I enjoyed watching the sunrise every morning and would definitely return. I have allergies and the only comment I would make would be to use a cleaner not so strong in scents (pine). I sneezed for three solid days before the scent dissipated. I did appreciate how clean and well maintained the cabin was. Thanks again! 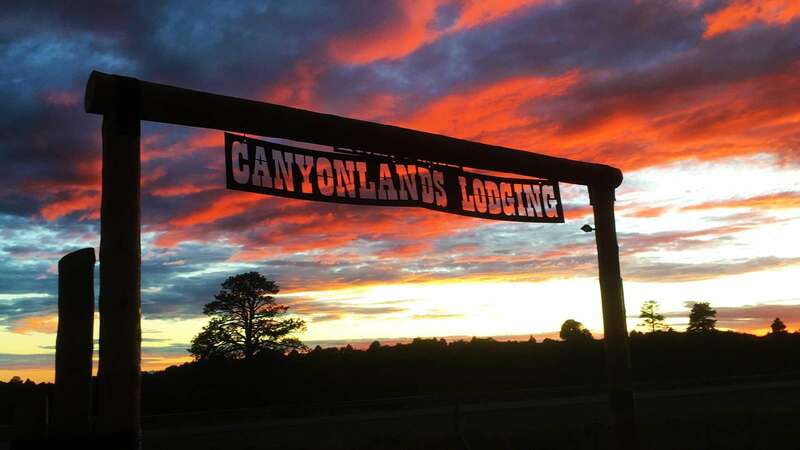 Our experience with Canyonlands Lodging was exceptional. The White Pine Cabin was clean and ready for us when we arrived. 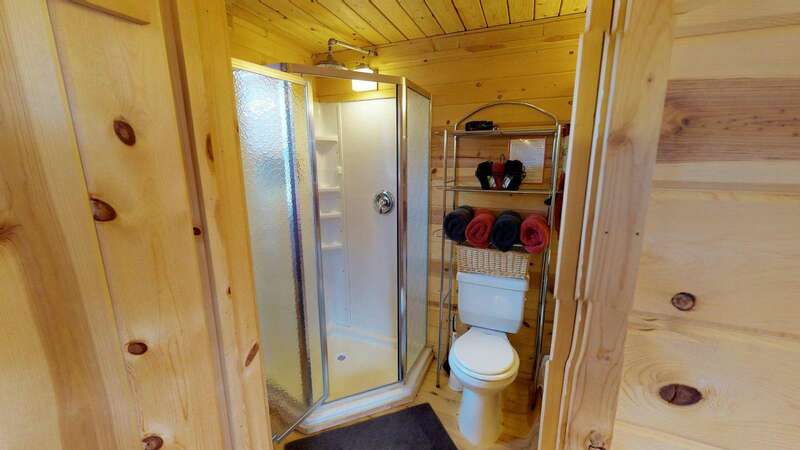 The cabin is equipped with everything anyone could ever need while on vacation. We appreciated the contact we received before, during and after our stay from the owners. Even though we never needed anything, it was so nice to have them just a text or phone call away. I highly recommend staying with Canyonlands Lodging. Vacation "5 of 5 stars by Bonnie JHad a great stay in white pine cabin, would highly recommend it. The cabin was very cozy and so neat. What a great location for the cabin. This is a stay we would love to repeat. The cookies on the table were such a nice welcoming touch. The cabin has lots of windows which gives a great chance to see the awesome view. Loved the White Pine little cabin! Clean comfortable, quiet, and roomy. The location was great, so tranquil. Also really appreciate that they allowed my dog. We could walk around the property and truly enjoy it. We found the White Pine cabin to be everything we expected and then some. It was very comfortable and well supplied. The setting was remote from other properties and because of this we had close sightings of elk and other wildlife. The best recommendation I can give is that we would stay again. We recently stayed in the White Pine Cabin while visiting Canyonlands last weekend. We wanted to stay away from the crowds and confusion of Moab and the cabin was perfect. We can't wait to come back. What a cute dollhouse. Just one night and had breakfast on the deck. You have done such a great job with the theme. We have seen glorious country here in southeast Utah. From Texas. Response: Thank you, this place is very cute. Hurry back! As part of traveling across the country I stumbled across the cabin online and was very grateful. We used it as a base for Moab and Monument Valley and is the most memorable room of our trip so far. It has THE comfiest bed know to man and you feel instantly at home. We didnt get to meet the owners but were thankful for delicious root beer and home made bread. If in doubt book it anyway, it's a great little place. We stayed at the White Pine Cabin last week of April. It was wonderful. Extreme peace and quiet. Very comfortable- I loved the sleeping loft. It was very well equipped for cooking. It's the first rental with decent knives! We were greeted with muffins so fresh they were still warm. We definitely plan to come back. 2 nights (4 Chicago adults @ the White Pines AND Ranch cabins) surpassed all expectations!!... Lovely, warm, homey and meticulously cared for. Hated to leave the grand seclusion. Had opted for 2 cabins since each provided only one bathroom. Otherwise, more room than needed to sleep, enjoy, relax, and eat. Wish we lived nearer to visit more often! The helpful agent and spouse were readily available. Great choice in Utah!! We stayed in the White Pines cabin last week and really enjoyed the seclusion! I agree with other comments: Window coverings in the living room would be nice for evening privacy, and alternate lighting in the bedroom would also be nice. As I'm an evening reader before sleep, I was unable to read with only an overhead light in the bedroom. We had 1 issue with the cable not working upon arrival and Josh was right out to fix it within 20 minutes of our contact to him. He was really on top of it! The cabin was stocked with cookware and everything we needed. We'd stay here again if we are in the area! We only stayed one night at White Pine Cabin but it was just about perfect. Quiet. Really quiet. Most any amenity one could wish for, even a magnifying mirror to stick on the bathroom mirror. The bedroom 3 light wall fixture did not seem to work or we just could not find the switch. With no floor lamps there was not really a place to read after dark, so we went outside and admired the stars. The ladder up to the loft was a bit intimidating but surely teens would love it. A great find, easy to rent in and out. e would stay again if in the area. We stayed at the White Pine cabin when visiting Canyonlands and Natural Bridges. We loved the cabin! It was close to the highway while being secluded and quiet. We could see more stars in the sky than we ever remember seeing. The cabin met all our needs, was very comfortable, and near towns - for restaurants, groceries and gas. The location is ideal and we would certainly stay there again. We stayed at the White Pine Cabin for family reunion. We also rented the Blue Mountain Lodge and Ranch Cabin. All 32 of us loved it . Very impressed how roomy,comfortable,homey and well appointed they were. My daughter and I stayed in the White Pine Cabin and just loved it. She enjoyed the loft.Thank you for helping make our family reunion a great success! We came from Salt Lake City and stayed at the White Pine Cabin over the Thanksgiving holiday and had a wonderful time! Even though the cabin was small it was fully equipped for us to make Thanksgiving dinner and cook all our meals. The cabins are close to many National Parks and monuments. We had some problems with the wifi when we arrived that were promptly taken care of. Next year we'd love to come back to the bigger cabin with more of our extended family. We will definitely stay there again! Three of us stayed in the White Pine cabin and it was the best place we stayed during our eleven day travel through the circle of travel through the national parks. Thank you so much for truly being an oasis in the desert. We will definitely be back. We stayed in the new White Pine Cabin for another wonderful Spring Break! Loved it! Just the right size for a family of 5. 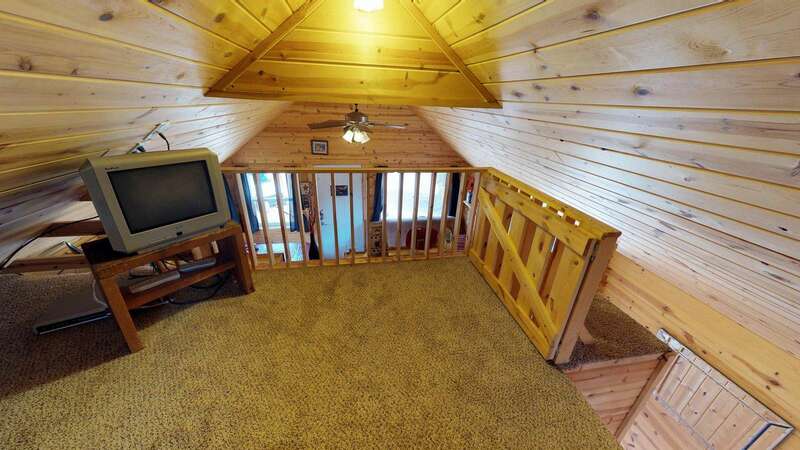 The kids LOVED the loft area and that they had their own tv area to watch movies. 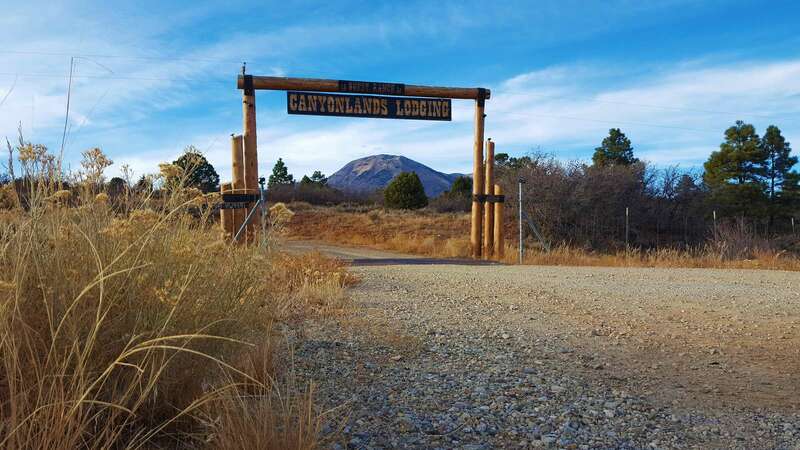 This is our 2nd stay with Canyonlands Lodging and the start of a wonderful family traditon. Thanks Josh for taking care of us! !